"And those twelve stones, which they took out of Jordan, did Joshua pitch in Gilgal. And he spake unto the children of Israel, saying, When your children shall ask their fathers in time to come, saying, What mean these stones? Then ye shall let your children know, saying, Israel came over this Jordan on dry land. For the LORD your God dried up the waters of Jordan from before you, until ye were passed over, as the LORD your God did to the Red sea, which he dried up from before us, until we were gone over: That all the people of the earth might know the hand of the LORD, that it is mighty: that ye might fear the LORD your God for ever." "Joshua Entering on His Work. [1 - 18]"
"Joshua. The Obedience of the People. [16 - 18]"
Chapter 2 "The Crossing of the Jordan. [2:1 - 7:26]"
"Joshua's Two Spies Sent. [1 - 7]"
"Treaty with Rahab. [8 - 14]"
"Spies Escape from Jericho. [15 - 24]"
"The Scarlet Thread. [18 - 21]"
Chapter 3 "Crossing over Jordan. [3:1 - 5:12]"
"The Cutting off; the Memorial. [9 - 16]"
"The Ark Going Before. [9 - 12]"
Chapter 4 "The Memorial: 12 Men, 12 Stones, the Place. [1 - 9]"
"Passing over Jordan. [10 - 13]"
"Joshua Magnified. [14 - 17]"
"God Dried up the Jordan for Passage. [20 - 24]"
Chapter 5 "The Circumcision of the Males. [1 - 8]"
"The Passover Served. [9 - 12]"
YHVH's One Captain. [13 - 15]"
Chapter 6 "The City of Jericho Given. [1 - 19]"
"The City of Jericho Taken. [20 - 27]"
Chapter 7 "TRESPASS OF THE ACCURSED THING." "The Trespass of Achan. [1 - 26]"
"Consequence, Defeat at Ai. [2 - 9]"
"Achan's Trespass put Away. [13 - 26]"
Chapter 8 "Conquest of the Land." "Conquest of Ai. [1 - 29]"
"The Performance. [23 - 29]"
"Joshua's Obedience. [30 - 35]"
Chapter 9 "League with the Gibeonites. [1 - 27]"
"The Deception Proposed, Carried out, Successfully." Chapter 10 "Confederacy Against Gibeonites. [10:1 - 11:17]"
"Confederacy Against the kings. [3 - 27]"
"Israel's Assemblage for War, [7 - 27]"
"Destruction of the Cities of the kings. [28-43]"
Chapter 11 "Kings Assemble. [1 - 5]"
"God's Command. [6 - 9]"
"The Cities Taken, Slain, Burned and Spoiled. [10 - 15]"
"Conquest of other kings. [16 - 23]"
Chapter 12 "Conquest of other kings." Chapter 13 "Civil Unalotted Land. [1 - 7]"
"East of Jordan. [8 - 33]"
Chapter 14 "Division Boundries of Tribes. [14:1 - 17:18]"
" Caleb's Inheritance. [6 - 15]"
Chapter 15 "Inheritance to Judah." "Establishing the Borders of Judah. [1 - 19]"
"Identifying the Cities in Judah's Inheritance. [20 - 63]"
Chapter 16 "Joseph's Inheritance, through Ephraim and Manasseh." Chapter 17 "Inheritance of Manasseh, and Seven other Tribes." Chapter 18 "The Tabernacle Set up at Shiloh. [1 - 3]"
"Directions for Survey of Land. [4 - 7]"
"Survey Executed on the Land. [18:8 - 19:50]"
"The Allotment of Benjamin. [11 - 28]"
Chapter 19 "The Inheritance of Simeon. 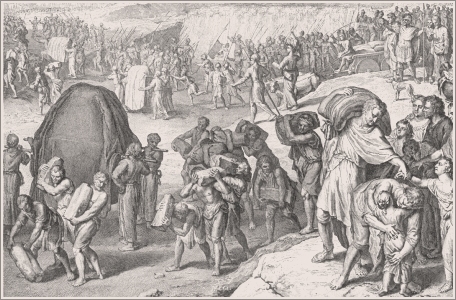 [1 -9]"
"Inheritance of Zebulun. 10 - 16]"
"Inheritance of Issachar. [17 - 23]"
"Inheritance of Asher. [24 - 31]"
"Inheritance of Naphtali. [32 - 39]"
"Inheritance of Dan. [40 - 48]"
"Joshua's Inheritance. [49 - 51]"
Chapter 20 "Sacred Cities. [20:1 - 21:42]"
"Cities of Refuge. [1 - 9]"
"Cities of the Levites. [1 - 42]"
Chapter 22 "Jordan. Events Connected Therewith." [1 - 34]"
"East of Jordan. [10 - 34]"
Chapter 23 "Joshua Ending His Word"
"Joshua's Address to Israel. [2 - 16]"
"Exortation to Follow the Law. [6 - 8]"
"Warning Against Evil Alliances. [11 - 13]"
Chapter 24 "Joshua's Address to the Elders. [1 - 28]"
"Remind. Abrahamic Covenant Made. [2 - 24]"
"Johsua's Epilogue. [29 - 33]"
"Obedience to Joseph and Jehovah's Command. [31 - 32]"